Article courtesy of NCWV Media - The Republican. 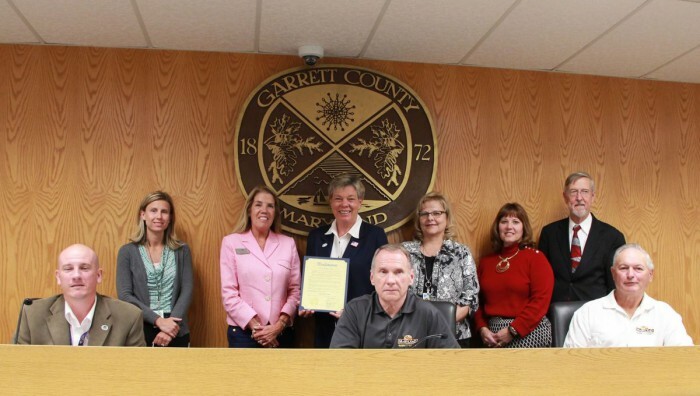 The Garrett County Board of Commissioners have declared October to be I Can Swim! Month, recognizing the initiative that provides all Garrett County kindergarteners with free water safety instruction and swim lessons. The program, which has successfully served more than 6,000 children since 2011, is a joint venture involving Garrett College’s Community Aquatic and Recreation Complex (CARC), the Garrett County Board of Education, the Garrett County Board of County Commissioners, and the Garrett College Foundation. "The college greatly appreciates the commissioners' recognition of this extremely important program," said Dr. Richard Midcap, Garrett College's president. "We are pleased to work with such great partners as the commissioners, the board of education, and the Garrett College Foundation in providing the critical water safety education and swim lessons that all kindergarteners receive." Dr. Midcap noted that the initiative welcomes a new partner this year, the Garrett County Public Schools Foundation, which is working in tandem with the Garrett College Foundation to raise money for the continued operation of the I Can Swim! program. The college also recently announced a $5,000 lead gift by the WGW Community Youth Cup to help support the I Can Swim! program. "We are trying to use I Can Swim! Month to raise both program awareness and the funding necessary to ensure the long-term sustainability of the program," said Dr. Midcap. "This is one of the most impactful community programs we produce, and it's one that has my strong support."